Following up on the Cygnar logo sheet, the Khador one and the Menoth one, our good friends over at Privateer sent over this printable sheet of Cryx goodness for you hobby enthusiasts! I love painting up a nice warjack, but the inner scale modeler in me just wants that bit of extra coolness that only decals can provide. 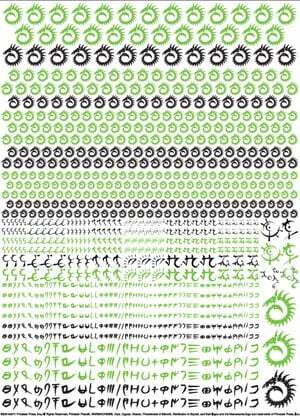 So here is a set of very cool Cryx logos in a variety of colors and sizes that not only includes the nation logo, but their alphabet as well. In particular, you Nightmare Kingdom fans will want to note the set of Warcaster “brands” on the middle right of the sheet which have been scaled perfectly for you to apply to your warjacks to tie your battlegroup together perfectly. Size wise, the larger decals are best used for heavy jacks, or even buildings and terrain peices, and move down in size to the large array of infantry sized towards the bottom. In any case, enjoy and I wish you the best in using this set to really dress up your Nightmare Kingdom forces. ~Please feel free to leave comments, and I have a funny feeling we can expect more of these coming down the pipe in the months ahead.